One of the things I am really enjoying about Agents of SHIELD is how well they tie in with the other Marvel projects. Even this week, there are references to both the first Captain America movie and the upcoming Agent Carter tv series (which I’m REALLY looking forward to). “The Things We Bury” does a great job bridging the Marvel Cinematic Universe’s past and present. 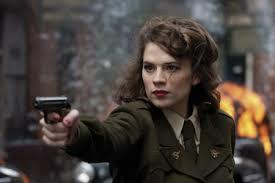 There are several scenes set in 1945 and later, with Agent Carter dealing with some of Hydra’s agents. These scenes set in motion events that play into SHIELD’s current problems. We learn a lot more about Skye’s father, the so-far nameless doctor (I am NOT calling him The Doctor). His past connects to Hydra, the Obelisk, and many of us think to a recently announced Marvel film. Hydra’s operations in the 40′s are disrupted when the Red Skull is defeated, as seen in Captain America: The First Avenger. Coulson puts together a nice, Mission Impossible type of scheme, sending Skye and Trip out to do seemingly random things in Hawaii. The payoff shows that Fury picked his successor as Director well. It was an elaborate scheme but it worked. Coulson is a tactical genius. Mostly off away from the rest of the cast, Agent Ward, formerly of SHIELD, maybe of Hydra, possibly free-agent bad guy settles some family matters. This is usually where a lot of people make the joke that Thanksgiving dinners would be really awkward, but I don’t think that will be an issue. I’m really not sure whose side Ward is on at this point, and I’m not wholly convinced he is, either. I do like that they finally showed Trip back in the field, but I’m not sure why this was a trade-off. Both Bobbi Morse and the formidable Agent May end up back at base. There was a decent explanation as to why Morse wasn’t running and gunning, but May was seemingly left behind because Coulson said, “I said so.” The process of deciding who goes on which missions seems to be utterly random. There are a lot of revelations about Skye’s past. Ward isn’t the only one with a complicated family history. Her father seems to be perfectly willing to kill anyone who not only gets in his way, but just more or less inconveniences him. Ok, wild speculation time, so skip this paragraph if you’re so inclined. Blue skinned aliens have been playing a part of Agents of SHIELD for a while. We’ve now learned there’s a hidden city, and certain humans have something that ties them back to it, genetically. Currently in Marvel comics, there’s a storyline going on when they are revealing that some humans (like the current popular Muslim Ms. Marvel) have ties to the hidden race of Inhumans, and their city Attilan. The Inhumans were created when an alien race called the Kree (who have blue skin) experimented on some humans. The Inhumans is one of the films Marvel announced for down the road. And, in at least one interview, it was confirmed the blue aliens on SHIELD are Kree. So, is Skye’s father, and Skye by extension, an Inhuman? Or maybe her mother? Or both? It seems possible, even likely, to me. What I liked: Trip is out in the field again! Coulson pulls off a great plan. Fitz is still improving, and at a slow but believable rate. They played off both Captain America and Agent Carter very well without it feeling forced. Hunter and Bobbi have an amusing scene together. I’ll give this one a 3.5 out of 5. I think the show is consistently getting better, and I’m overall happy with the direction it’s going.